Mixed martial arts competitions have already proven to be major economic drivers across New York, and the jobs and revenue generated by this event illustrates the enormous impact of this growing industry in our state. This activity is illegal and needs to be stopped. This is supposed to be a tourist attraction, family friendly, the new New York symbol. 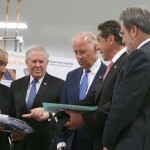 Biden and Cuomo announce a photonics initiative in Rochester, that will hire about 100 scientists and other experts and get to work on a handful of research projects within about five months. The $600 million initiative includes $110 million in federal funding, $250 million from New York state, and the rest from private companies. Supporters say the project could mean thousands of jobs for the region as it brings together government, industry and academia to advance photonics research and its use commercially. You’ve gone from making Brownie cameras to lenses that are now mapping the far side of Pluto…AIM Photonics is going to act as a central hub and will give Rochester photonics businesses the space and the capacity they need to generate the next generation breakthroughs and secure American leadership in the manufacturing of integrated photonics. A panel appointed by Cuomo recommends a $15 an hour minimum raise from the current minimum of $8.75. The first wage increase should come by Dec. 31, taking the minimum in the city to $10.50 and in the rest of the state to $9.75. The wage in the city would then rise in increments of $1.50 annually for the next three years, until it reaches $15 at the end of 2018. In the rest of the state, the hourly wage would rise each year, reaching $15 on July 1, 2021. The mandate will apply to all workers in fast-food restaurants that are part of chains with at least 30 outlets. We have information that would suggest that Vermont was discussed as a possible location…We need to find these escapees. They are killers. They are murderers. These are dangerous men capable of committing grave crimes again. Gov. Cuomo announces that people arriving in New York State after having contact with Ebola victims in west Africa will be required to stay at home for 21 days, a modification that is more in line with federal guidance. Cuomo also says Spencer ‘went out in a limited way’. We believe it’s appropriate to increase the current screening procedures from people coming from affected countries … We believe it within the State of New York and the State of New Jersey’s legal rights. 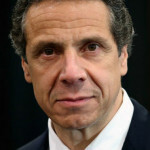 Cuomo signs the Compassionate Care Act today in New York City. The bill will allow doctors to prescribe nonsmokable forms of marijuana to patients with serious ailments. We are here to help people. And if there is a medical advancement, then we want to make sure that we’re bringing it to New Yorkers. The program is expected to be one of the most regulated medical marijuana programs in the country. Criminal charges will be filed against anyone trying to defraud the system. The governor says he can suspend the program if there is a rick to public health. New York is the 23rd state to allow medical marijuana.